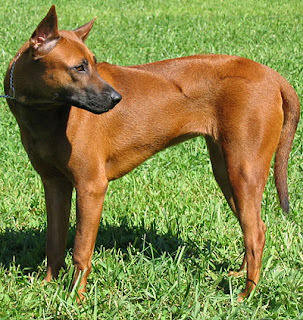 The Thai Ridgeback originated in Thailand and is referred to as the oldest breed in the world. They not only possess a lot of stamina and are brainy, but are also brave and fearless and have a tendency to protect their family. Owing to the above mentioned qualities they are used for hunting, as watch dogs and guard dogs. They possess a lot of strength and are very sporty. They can adjust to different environment quite easily. Being a very loyal breed, they tend to become destructive if left alone for a long period. They are also used as pet dogs because of their ability to do well in a family and get along with small pets. They however, like most other breeds, require early socialization and obedience training. They need consistent training and behave well if properly trained. However, the training must be done fairly, firmly, devotedly and patiently as the breed will not respond to harsh methods. Although it is a very calm breed but it is not recommended for inexperienced owners. It has two types of coat, one having a hard, short and thick outer coat and thin undercoat whereas the other has short, thick and velvet texture. It needs a lot of exercise and hence the owner should take out time for their proper exercises. It does not shed heavily and hence the coat needs to be brushed on a regular basis to avoid dirt and dead hair. Bathing needs to be done only when mandatory. They are apt for apartment living if given proper exercise. However, they are best suited to a rural setting with a job to do. The Thai Ridgeback is a relatively healthy breed and lives for nearly 12-13 years. However, it may be prone to hip dysplasia and dermoid sinus.